Stronger-than-expected production schedules from GM, Ford and Chrysler is prompting analysts to raise their earning outlook for Canadian parts suppliers. TORONTO -- Canada's big auto parts suppliers are on the road to recovery as pent-up demand powers growing sales of new vehicles in North America, a trend expected to gather speed gradually through the remainder of the decade. Still, challenges linger for the companies that make everything from car seats to chassis, and analysts say they must look beyond rebounding domestic markets if they are to continue to grow. "What's really going to be key is how they are positioned in the emerging markets, because that's where the growth is going to come from," Scotiabank economist Carlos Gomes said. Setting strategy to tap new markets is a turnaround from the grim conditions of 2009, when an auto industry on the verge of collapse was salvaged by multibillion-dollar bailouts by Canadian and U.S. taxpayers. Back then, General Motors and Chrysler looked like they were headed for the scrap heap, with the potential to take suppliers with them. But the industry pulled back from the brink, staging a slow-but-steady comeback that has helped lift Canada's biggest listed parts suppliers: Magna International Inc, Linamar Corp and Martinrea International Inc.
Magna shares have more than tripled in value from the dog days of early 2009, but remain about 15 p ercent below prices in the robust period of late 2007. Likewise, Linamar stock has roared back from a C$2 low point in early 2009 to C$20.37 on Friday, but still lags an October 2007 price of C$26.48. Some industry analysts say auto parts suppliers' shares may be poised for further gains as consumers look to replace growing numbers of worn-out clunkers. "The demand picture is pretty solid right now. Certainly we've seen significant recovery from the big downturn of 2009," said Steve Rodgers, president of the Toronto-based Automotive Parts Manufacturers' Association. Stronger-than-expected production schedules from GM, Ford Motor Co. and Chrysler prompted BMO Capital Markets analyst Peter Sklar to nudge higher his earnings estimates for Magna, Linamar, Martinrea, and smaller players Exco Technologies and Wescast Industries Inc.
Industry trade journal Ward's Automotive sees third-quarter output from the Detroit Three rising 9 percent from the same period last year, well above Sklar's 2 percent growth estimate. The beefier forecast is significant because "Detroit Three vehicle manufacturers are the primary customers for the Canadian auto parts suppliers in North America," Sklar said in a note. A host of factors underpin production increases, said Morningstar analyst Richard Hilgert. "There's a lot of pent-up demand out there," he said "You've got used car prices that remain high, which makes new cars still look attractive, the number of drivers' licences continues to grow and ... the number of miles driven continues to do well, meaning that cars are wearing out." Improved economic conditions and aging vehicles, now a record 10.8 years old on average, are also boosting sales. Morningstar estimates North American light vehicle sales at 16.4 million to 16.8 million for 2012, a figure that grows to 19 million vehicles in the latter half of the decade. Scotiabank's Gomes sees North American vehicle production up 15 percent in 2012 to 15.3 million units. "The point that's important is for full-year 2012, you'll see vehicle production in North America in excess of 15 million units for the first time since 2007," Gomes said. "We're positive in terms of the outlook for the next several years, provided we don't have something that knocks the economy down again." While markets and policymakers are focused on Europe's debt crisis, the region's problems are not seen having a major impact on Canadian auto part suppliers, Sklar said. 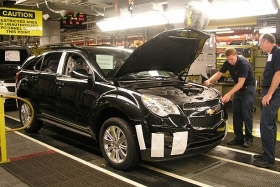 Western European vehicle production, down 7 percent in the first quarter over last year, is expected to continue declining in 2012. The impact on Magna and Martinrea may be softened by a European customer base that includes companies with strong exports, he said. Europe aside, other issues are hampering growth. "What's holding us back is that the U.S. housing bubble hasn't really completely worked its way through the system," Hilgert said. "Consumers no longer have the home equity piggy bank to draw on for large ticket purchases." Stubbornly high U.S. unemployment is another key hurdle, along with poorly performing stock markets that have hurt pension fund performance and encourage an aging population to save for retirement, rather than spend. But it may be Canada's reliance on the big U.S. market that poses the biggest threat to prosperity. In a recent report, Gomes wrote that Canada's auto parts manufacturers have fallen from the ranks of global top 10 exporters because they have not found a way to tap into the rapid growth in low-cost markets in Asia and Latin America. The United States takes 57 percent of all parts shipped from Canadian plants, but the U.S. share of global vehicle assembly has slipped to 10 percent from about 25 percent in the mid-1990s, the report said. "Canadian automotive suppliers are waking up to this," said Rodgers. "(But) we need to pay more attention."